Memory chip is a device used to store information and data or process code. They are available in different shapes and sizes. Some can be connected directly, whereas some need special drives. They hold memory either temporarily through random access memory (RAM) or permanently through read only memory (ROM). Data stored in ROM are permanently stored, which a processor can read but cannot modify. 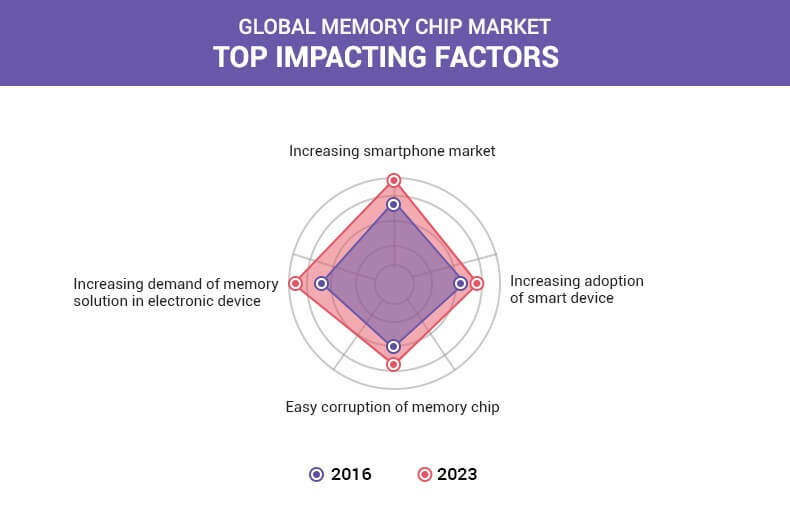 The growth of the global memory chip market is driven by rise in smartphone penetration, high-density storage capability, and quick read & write cycle. Moreover, availability of different shapes & sizes of memory chips fuels the adoption their in the digital domain. However, corruption of memory chip is expected to restrain the growth of the market. Conversely, surge in demand for memory chips in electronic devices is anticipated to provide potential opportunities for market expansion. 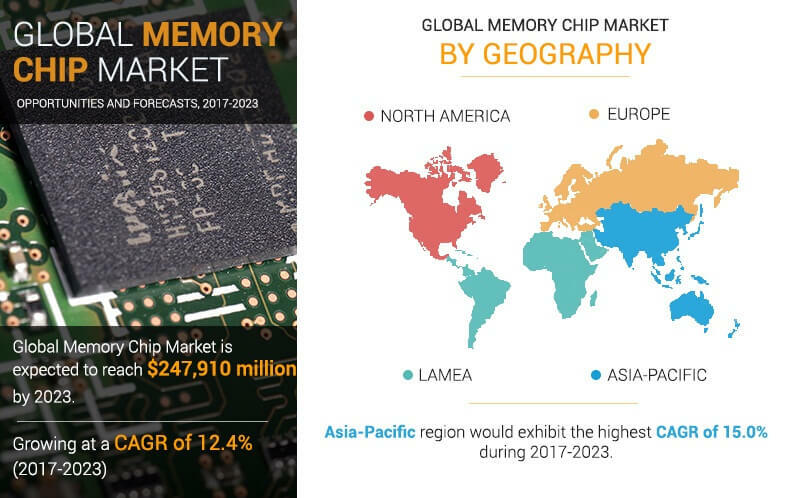 Samsung Group, Sony Corporation, Toshiba, ADATA Technology, SK Hynix, Micron Technology, Intel, Kingston Technology, Transcend Information, and Fujitsu Microelectronics Inc. are some of the key players operating in the global memory chip market. The memory chip market is segmented based on type, application, and geography. On the basis of type, the market is categorized into volatile and nonvolatile memory chip. The applications considered in the study include laptop/PCs, camera, smartphone, and others. Geographically, the market is analyzed across North America, Europe, Asia-Pacific, and LAMEA. The global smartphone market is witnessing high growth rate. According to the Federal Reserve Board reports, in 2015, 80% of the U.S. adult population used mobile phones, out of which 71% were smartphone users. Increase in sales of smartphones is due to its combined multi-platform services for various applications such as music, video, financial transaction, and most prominently the accessibility of internet. The memory chips provide enhanced storage capabilities to smartphones. In addition, they are available in compact sizes that can easily be used in small devices such as smartphones to enhance processing power, rebooting functionality, and content storage. Therefore, upsurge in penetration of smartphones drives the demand for memory chips, thereby accelerating the growth of the market. The adoption of smart devices such as smart glasses & helmets, fitness tracker, smart watches, tech-enabled lanyards, cards, wireless headsets, and others is rising, as they offer various advantages such as easy access to information from an ERP system using touch, gesture, voice commands, and ambient & glanceable display. In addition, smart devices have transformed the traditional working process as they track, monitor, and store data automatically. These feature require large space to store data and information, which increase the demand for memory chips. Thus, rise in adoption of smart devices supplements the market growth. Memory chip is an efficient memory solution for various electronic and smart devices, including smartphones, tablets, camera, video game consoles, laptops, and others. However, corruption of memory chip like other memory storage devices is expected to hamper the market growth. This study comprises analytical depiction of the global memory chip market with current trends and future estimations to portray the imminent investment pockets. 7.1. ADATA TECHNOLOGY CO., LTD.
7.4. KINGSTON TECHNOLOGY COMPANY, INC.
7.6. SAMSUNG ELECTRONICS CO. LTD.
Memory chip is a device in which information, data, process code, and program instructions can be stored for retrieval. These chips are available in multiple shapes and sizes. Some can be connected directly, whereas some need special drives. They hold memory either temporarily through random access memory (RAM) or permanently through read only memory (ROM). Data stored in ROM are permanently stored, which a processor can read but cannot modify. By application, the market is segmented into Laptop/PCs, Smartphones, camera, and others. Based on type, it is classified into volatile and nonvolatile memory chips. By type, nonvolatile memory chips was dominant segment in 2015, and is anticipated to continue its dominance during the forecasted period. By application, smartphone segment witnessed highest growth rate during forecasted period, followed by laptop/PC. Samsung Group, Sony Corporation, Toshiba, ADATA Technology, SK Hynix, Micron Technology, Intel, Kingston Technology, Transcend Information, and Fujitsu Microelectronics Inc. are key market players that occupy a garner revenue share in the memory chip market.